Our goal is to provide you with the finest plastic surgery services possible. What makes this office unique is our commitment to excellence and our dedication to patient care and safety. The purpose of this document is to introduce you to Dr. Kludt and the Plastic Surgery Center of Stockton. If you should have any questions, please do not hesitate to call. 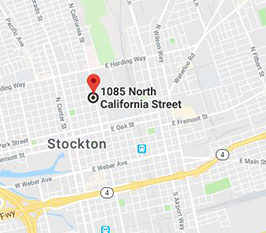 Our office is located in Stockton on California Street, just two blocks north of the intersection of California Street and Harding Way. We are directly across the street from St. Joseph’s Medical Center. Parking is available in our private lot located directly behind the building. Our office is open from 9:00 a.m. to 5:00 p.m. Monday through Thursday, and 9:00 a.m. to 1:00 p.m. on Fridays. Our office contains a modern outpatient surgery center, which is fully accredited by the American Association for Accreditation of Ambulatory Surgery Facilities, Inc. (AAAASF). Surgery is available under local or general anesthesia. Our anesthesiologists are all Board-certified. A great deal of our surgery is also performed at the Ambulatory Surgery Center of Stockton, a free-standing ambulatory surgery center located at 2388 N. California Street, Stockton, just a few short blocks North of our office. Protecting the privacy of our patient’s medical information. Appropriately maintaining our patient information and billing processes in compliance with national standards. If you ever have any questions or concerns about our office policy, we encourage you to contact us and ask for our Compliance representative. Smoking is not permitted in the Plastic Surgery Center at any time. We love children; however, in consideration of other patients and to allow your visits to be as focused as possible, we kindly request that children not accompany our patients to their scheduled appointments. In order to provide the best possible service to our patients, we request that you arrive in plenty of time for your appointment. We suggest that you arrive 15 minutes early for a “New” patient visit (to allow time to complete registration paperwork), and 10 minutes early for all other visits. All fees for cosmetic surgery are payable in advance by cash, personal check, or credit card. We do accept VISA, MasterCard, and CareCredit for your convenience. Credit cards are subject to a 3% convenience fee. There is a $25 fee assessed to all returned checks. Payment for cosmetic surgery is customarily paid at least two weeks before the scheduled surgery. There are generally six financial components to the cost of a surgery: (1) Surgeons professional fee, (2) the surgery center fee, (3) the anesthesiologist’s fee [if appropriate], (4) laboratory fees [for required blood and EKG tests before surgery], (5) special services, which are rarely indicated [i.e., pathology and/or radiology], and (6) special supplies [i.e., implants, implantable devices, injectables]. Our office will not bill insurance for any cosmetic procedure performed. The patient is ultimately responsible for all professional services performed. All elective surgery that qualifies for insurance coverage must be successfully pre-authorized before surgery can be scheduled. There are no exceptions to this rule. Surgery fees will be discussed openly with you before scheduling surgery. It is impossible to determine what your insurance company will pay for any procedure. There are wide variations in payment depending on your company, your specific plan, and your unique group, and the specific surgical procedure performed. We will require a $500 booking fee before surgery can be performed. If there is a credit on your account after the insurance company submits their payment, that credit will be promptly refunded to you. We will submit your claim to your insurance company as soon as possible following surgery. If, however, we have not received payment from your insurance company within ninety (90) days of submission, you will be billed for the entire balance of the surgery on the 91st day. For a first-time cosmetic surgery consultation with Dr. Kludt, the fee is $55 and is collected when the appointment is scheduled. If patients schedule surgery within 60 days of their consultation, the entire $55 consultation charge will be applied toward the surgical fee. First-time patients will also be required to place a scheduling deposit when making appointments with our injection specialists and/or medical aesthetician. In the event that you cannot make your scheduled appointment, please contact us to cancel within two (2) business days prior to your scheduled appointment in order to receive a refund of your deposit. For the convenience of our patients, product purchases and payment for services may be facilitated over the telephone. Charges for these transactions will be made to the credit card provided by the patient. You will be advised of the amount charged at the time of your purchase; however, please understand that there may be additional fees for packaging, handling, shipping or postage. Availability for appointments is very competitive. In the event that you cannot make your scheduled appointment, please contact us to cancel within two (2) business days prior to your scheduled appointment. Any less notice will result in a loss of your scheduling deposit. A consultation with Dr. Kludt is required before surgery can be scheduled. There are no exceptions to this rule. Our practice is limited exclusively to elective cosmetic and breast reconstruction surgery. All fee quotes are valid for three (3) months from the date of the initial consultation. It is important to understand that there will likely be certain additional costs (i.e., prescription medications, outside laboratory tests, postoperative supplies and materials), which are not included in the surgical fee. If the surgery is less than $500, the surgical deposit is the actual amount of the surgery. If the surgery fee is between $500 and $5000, then the surgery deposit is $500. If the surgery fee is between $5000 and $10,000, then the surgery deposit is $1000. If the surgery fee is greater than $10,000, then the surgery deposit is $2000. The remaining balance due, which will be clearly outlined to you in subsequent correspondence, must be paid in full at the time of your presurgical visit, which typically occurs approximately two weeks before the actual day of surgery. If you elect to pay your surgical balance with a credit card, there will be a additional 3% convenience fee. As with all surgical procedures, plastic surgery involves certain risks, limitations, and the possibility of complications. We seek to obtain the best possible surgical result, but there is no absolute guarantee or warranty as to the final result that may be achieved. Surgical fees are paid for the performance of surgery and not for the realization of an exact anticipated result. Although unusual, revisionary surgery is sometimes necessary. In our experience, this occurs in less than 5% of patients. If it is determined that if revisionary surgery is necessary within the first six (6) months following the original surgery, the following policies will apply: (a) each case is individualized to decide if any additional professional fees are appropriate, (b) patients will be fully responsible for all “support costs” (operating room facilities, anesthesiologist, laboratory fees, pathology fees, implants, supplies, etc. ).